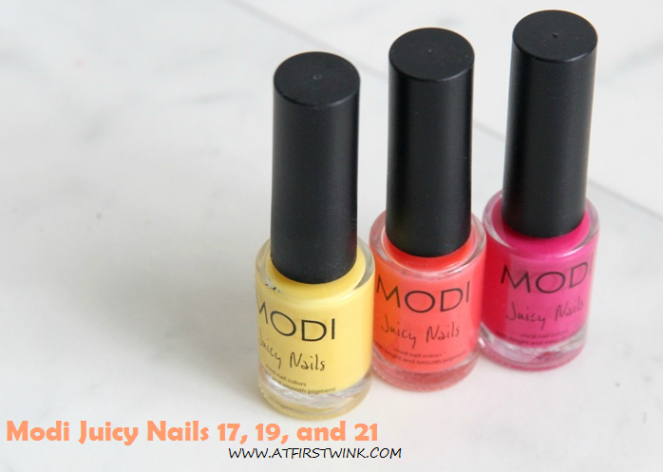 As you could have seen in my 13th Gmarket order post, I bought three bottles of Modi Juicy Nails nail polishes. It was the first time I bought Modi nail polishes from the Juicy Nails line instead of the Glam Nails line. The first thing I noticed was that the bottles are a lot smaller than those from the Glam Nails line. I couldn't find the exact contents of the bottles, but it is about a half smaller. As you might have guessed from me being seriously drawn to coral and orange colors lately (and from the title of this post), I wanted to show you the Modi Juicy Nails nail polish no. 19 first. You might not have guessed from looking at the nail polish bottle, but the Modi nail polishes from the Juicy Nails line are actually jelly nail polishes. So as promised to Jo, one of my readers, this is the start of a series of jelly nail polishes posts that I will be writing. The Modi Juicy Nails no. 19 - Cherry Glaze is a very pretty, sheer, orange/coral jelly nail polish, so I don't get the reference with cherry. I needed to apply three coats to receive the results as shown in the pictures. Two coats would have also been enough, but then the white edge of the nails would still be a bit visible. The nails stay glossy for at least two to three days and I am quite impressed by that. It dries quite fast too, so building up the layers wasn't annoying at all.